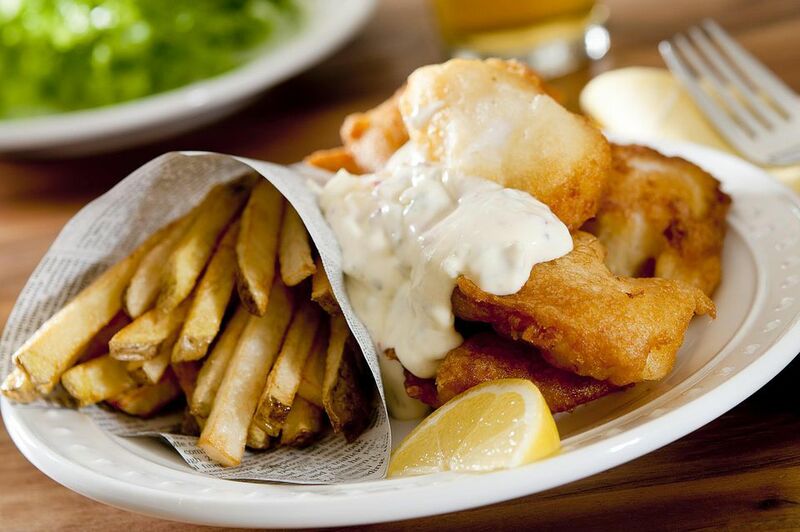 Fish and Chips down at the beach is a perennial Aussie and Kiwi favorite. The fish is usually coated in a light, golden batter (often made with beer) with a side of hot chips or potato scallops covered in salt and vinegar. These days, it's quite the norm for fish and chips to be served with Thai sweet chili sauce instead of the more old fashioned tartare sauce. For the batter, use a dry, light beer such as Australia's Victoria Bitter. Just a caution -- the recipe uses very hot oil in the frying process, so make sure that none of your cooking utensils have any water on them as this can cause the oil to splatter. In a medium mixing bowl, sift together the flour and salt. Use a whisk to mix in the beer and enough cold water so that the batter resembles thick cream. Set batter aside for 20 minutes to rest. Peel and cut the potatoes into even-sized, thick fries (chips). Place potato slices on a paper towel and pat dry to drain any moisture. Place oil in a deep saucepan and heat over high heat. Once the oil starts swirling, fry the first half of the chips in batches for 3-4 minutes until they start to go golden. Remove chips with a slotted metal spoon and drain on paper towels. The chips will seem soggy at this stage so handle them with care. Repeat process with the second batch of chips. Remove and drain on paper towels. Fry the first batch of chips for a second time for 1 minute or until they turn a deep golden color. Remove with a slotted metal spoon and fry the second batch of chips for 1 minute. Remove and drain. Season chips with sea salt and then place them in the oven on a very low heat to keep warm. Dip one fish fillet at a time into the batter and gently lower it into the hot oil. Cook fish, turning occasionally, for 4-5 minutes or until golden brown and cooked through. Use a slotted spoon to transfer fish to a plate lined with paper towels. Repeat process with remaining fish. Serve fish and chips on plates with Thai sweet chili sauce for dipping and lemon wedges for squeezing.